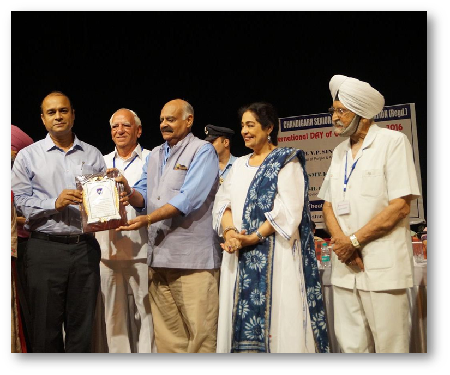 Cdr Jelson Kavalakkat, Unit Head – Administration, received an award on behalf of FHM, from Chandigarh Senior Citizens Association. This appreciation was given to place on record, the gratitude of the seniors, for supporting them in rendering service to the community by organizing Socio-Medical Camps. The award was presented by Kirron Kher, MP, Chandigarh along with Mag Gen MS Kandal and IP Puri.